Are you a space fanatic? 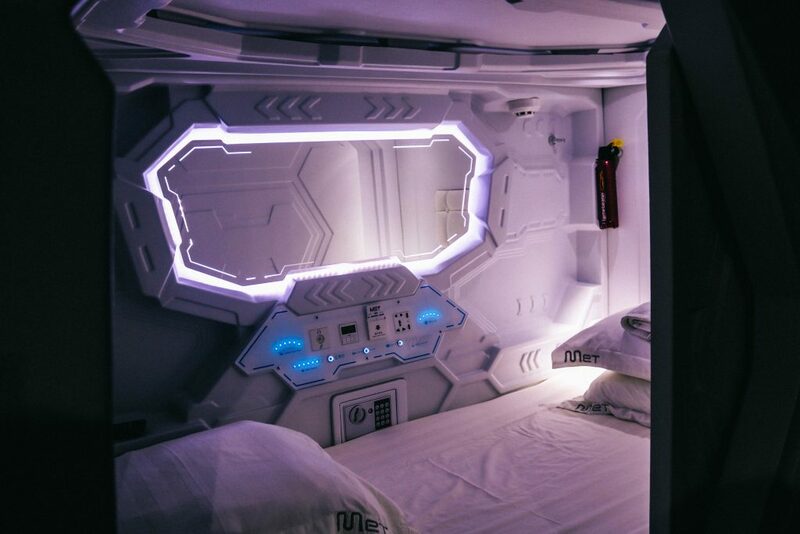 The UrbanWire brings you to Singapore’s first ever space-themed hostel. After I had climbed into this 1.9 m-long and 1.5 m-wide sleeping pod, I sat in darkness and tried to make sense of where I was. I could touch all four walls with just the stretch of my arm, but the sleeping pod felt comfortable. There was no natural lighting but streaks of blue light caught my attention as the power came on. 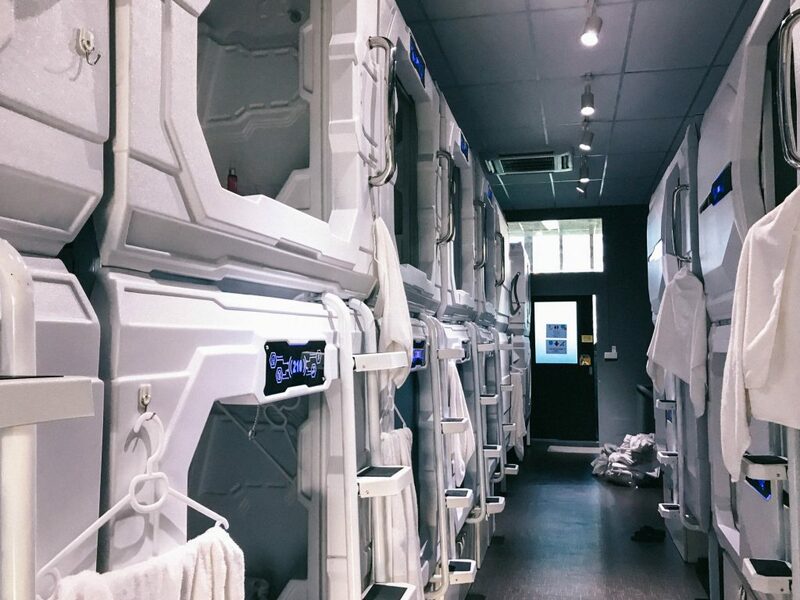 I spent one night at Met A Space Pod, Singapore’s first ever Space-themed hostel. It consists of Spaceship-like sleeping pods, communal bathrooms, a lounge and a café. This unique hostel has also been featured on The Huffington Post as one of the twelve Incredible Hostels Every Traveller Should Visit In A Lifetime. However, they have had their fair share of difficulty assembling and maintaining the pods. This hostel has two branches. One is strategically located along Clarke Quay with a river view and wide variety of restaurants. The other is located along shop houses on Race Course Road and is a 10-minute walk away from Farrer Park MRT Station. The place is easy to spot as there is a large sign displayed outside. There are three different lights in the pod; space blue, white, and reading lights, all adjustable with touch and drag technology. There is also a locker and safe beneath your pod to place your belongings and valuables. For your entertainment, there is a TV which contains hundreds of movies which are updated regularly. 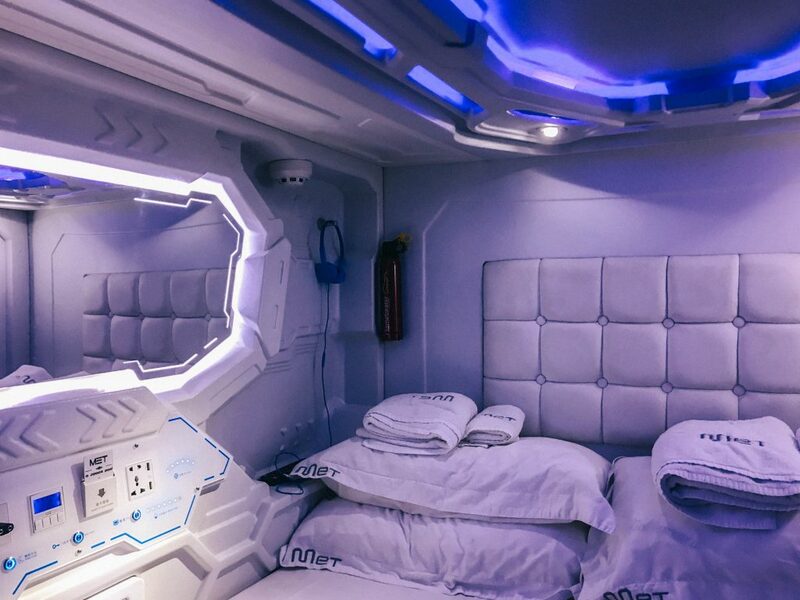 If you hear snoring, the hostel has free earplugs for your use as the space pods are not sound-proof. Don’t worry about your phone battery running flat too as they have multiple charging ports. Met A Space Pod also offers its pods for afternoon naps. The price varies according to demand, with S$18 for the first hour and additional S$5 increments per extra hour. However, the prices fluctuate and changes according to customer demand. Ms Ng mentioned that these are to “encourage locals who want to experience what it’s like but don’t want to stay overnight. Up to two children of ages three and below can have the couple bed with their parents.” Couple beds are only available in the Little India branch. Sri Anand, a 40-year-old Singaporean customer at the hostel, said: “This is my first time here, and the prices are more affordable, cleaner and more comfortable compared to other local mini-hotels”. Ms Ng shares: “We have had mildly claustrophobic guests who said that they didn’t really feel anything as the pods were wide and tall enough for them to sit up straight, or do their hair and makeup.” The hostel also has pods with blinds instead of doors, for claustrophobic customers to feel more comfortable when they see light coming through. The hostel also has a comfortable lounge that offers a twenty-four-hour snack bar, gaming station and movie screening every night. Customers can view the row of shophouses from the balcony or spend some time reading a book. If you’re craving for a ‘space-ial’ experience, Met A Space Pod is a place to go.